Modern Staircases & Railings / Floating Stairs / What are Floating Stairs? Floating staircases are designed to minimize or hide the supporting structure of the staircase. This gives impression that the stair treads are floating. Floating stairs are popular in open concept spaces. They remove visual obstructions and maximize living space. These stairs are well-known for their design. They can be installed indoors or outdoors, for businesses or homes or remodels. They can be paired with several different types of railing and handrail options — often, they are installed with glass, cable, or rod railing. Many of these options come with components that can be hidden in the posts themselves: to enhance the illusion of floating. Modern, elegant, and forward-facing, the floating staircase profile is quickly becoming a cornerstone for interior stair design. “It’s one of the main cornerstones of a modern house. Done properly, it becomes an architectural gem that makes everything feel more spacious and light.” – Mayer Dahan, chief executive of Prime Five Homes, a Los Angeles real estate development and renovation firm. You may be familiar with traditional stair design — where a stringer (often made of wood) sits on either side of the flight of steps. Floating stairs differ from traditional staircases. Instead of being fixed to a substrate on either side of the steps, the stringer (or stringers) supports the staircase from below. Stringers come in a variety of materials; we manufacture our stringers from steel. Depending on the design, a floating stair may incorporate a double or single stringer. Our floating staircase stringers are unique in that they are flow-drilled, rather than welded. Welding distorts the metal, causing a scar on the metal where the two parts are joined together. It doesn’t look great, and that requires extra effort from a design perspective to be able to cover up the look of the metal in the spot where it’s been welded. Flow-drilling (or friction drilling) eliminates the weld entirely. We use a flow drill to create a long hole in the metal. The steel is displaced — not by heat from the drill bit — but by the friction that is caused by the flow drill’s quick movement. The metal bends downward, creating a circular tube. We change out the drill bit, then repeat the process to add threads to the circular tube so that a bolt can be inserted. Flow drilling also creates a rim around the top of this circular tube, where the bolt rests. A bolted stair mono stringer is also easier to ship, because instead of shipping the steel stringer with all of the welded brackets, we can ship the mono stringer and brackets separately, and the customer can easily bolt them together at home or on the job site. 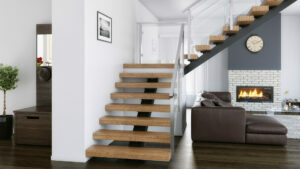 Sporting an open, minimalist look, the floating straight stair is very appealing for modern homes. You can use a single mono stringer, double stringer, or even a side stringer to install this configuration. Lots of young people are using straight stairs when they’re remodeling their home. Rejecting the idea of a steel stringer altogether, the floating cantilever staircase has treads that are fixed only at one end. The other end either floats free, or is secured to glass rail or posts to hold up the handrail. The treads are attached to the wall in a variety of ways — using a metal frame, pockets in the wall, or even, on rare occasions, a single stringer that’s fixed to the wall. This is another popular choice among trendy remodels. The cantilever stair can run into some real problems when it comes to code compliance. Done properly, it can be a beautiful statement — but we recommend always checking your local code regulation before installing something like this in your home. The spiral staircase has long been a classic in the design world — and the spiral floating stair is frequently seen in small spaces, such as a studio apartment. The floating staircase design keeps the home open and light, while the spiral configuration allows it to stay compact. There is occasionally some confusion regarding the difference between a curved staircase and a spiral staircase. Curved stairs simply turn gently while they rise, but they remain less than 90º. A spiral staircase makes several tight turns, and often make several 360º rotations. Floating staircases can be installed several different ways: with no steel stringer at all, with one specially-made, curved mono stringer, or with curved double stringers. Paired with curved handrail, the floating spiral stair is a good choice for the owner of a compact home — or any remodeling architect who is working with limited room.